Well, here you go, they've come right out and said it plain as day. It cannot be any clearer. The same applies to the Muslim faith. They believe that the Qur'an and the Hadith's are the word of Allah and they should obey them. This is not complicated. This means that "moderate" Muslims and "radical" Muslims are no different in belief, but only in practice. Same is true in Christianity. For example, whereas all Christians are called to share their faith, only a percentage actually do. But ask them if it is biblical to do such, and mostly all would agree. So it is with Islam. Is the word of Allah true or is the bible true? This is the crux of the matter. They both can't be true as they are mutually exclusive to one another. 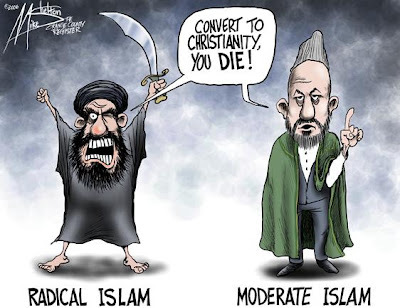 In the meantime, expect the ideology of Muhammad to continue to kill, steal and destroy and sadly, expect today's liberal minded American men and women to continue to defend the so-called "moderate" Muslims as people that would never agree with those that murder or behead or stone to death adulterers and homosexuals in the name of Allah, this simply is not true and the video below makes this perfectly clear. -W.E.